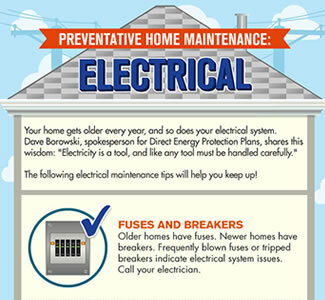 Even if you're a seasoned homeowner, you need to give your home the occasional electrical checkup to ensure that your wiring, circuit breakers, outlets, and plugs are in good working order and are used safely. Like any tool, electricity must be handled carefully/ It's very powerful, and we need to have a deep abiding respect for that power. To help you with proper maintenance on your home's electrical systems, we've created a list of simple tips and to-do's so you can double-check that your home is wired for safety. If you have breakers tripping and fuses blowing on a regular basis,it's time to bring in a professional to inspect your home. Be sure all your circuits are properly grounded. A circuit consists of wires transporting electrical current to your lights and appliances, so properly grounded wiring is connected to a ground wire in your home. All outlets near wet locations such as kitchens, bathrooms, or laundry rooms should be Ground-Fault Circuit Interrupters (GFCI). Water and electricity don't mix, so unplug any appliance before you wash or wipe it down. If you have children or grandchildren, put protectors in all your outlets or replace them with tamper-resistant outlets, as these outlets are now required by code in all new homes. Replace any frayed wires in your house, as they can potentially cause shocks or fires. Replace all plugs that wobble or fit loosely in the socket. Never force a plug into a socket, and never attempt to adjust a plugs metal prongs to make it fit. Both actions are dangerous! Make sure all plugs and cords are kept a safe distance from heat sources such as radiators or space heaters. Don't place furniture on top of cords, and don't run cords under rugs or blankets. Any indication of dimming lights, flickering lights, a sizzling sound, or a burning odor mandate a prompt professional investigation. Never plug a generator directly into your home's electrical system, as this can unintentionally damage appliances or even put you at risk. Hire an electrician to get it done safety. When outside, only use cords (and items) labeled for outdoor use. Extension cords are a temporary solution. They shouldn't be used to power home appliances on a permanent basis. Most extension cords aren't built to handle high-powered items such as air conditioners, refrigerators, or space heaters. Don't leave extension cords plugged in if they're not in use, as they can create an electrical or fire hazard. A key smart maintenance tip: Hire in a professional electrician annually to check your electrical systems, just as you would get a checkup for your personal health. A licensed electrician can check your electrical panel, tighten any wires that need it, and even use an infrared tester to identify which circuit breakers are getting too hot in the fuse box. This keep your electrical system working efficiently, and gives you peace of mind about the safety of your home. Find out easy, cost-effective ways to give your family an extra measure of protection against electrical costs and possible calamities by viewing our electrical home protection plans, or call 1-888-733-1683. Direct Energy's Electric Essentials plans fill the gap left by your homeowners insurance. Get maintenance and repair coverage you can depend on. Get protected today!